I only attended two classes on the second day of the BYU Conference on Family History & Genealogy. Both of the classes were held in the afternoon. The first class I took was titled "Beginning Autosomal DNA Analysis" and was taught by Paul Woodbury. Mr. Woodbury is a member of CeCe Moore's DNA Detectives Team. During his class, Mr. Woodbury shared information about the differences between autosomal, Y-DNA, and mt-DNA tests. Both Y-DNA (paternal direct line) and mt-DNA (maternal direct line) stay intact as they are passed down to future generations and mutations are hierarchical. On the other hand, autosomal DNA is mixed every generation, mutations are not hierarchical, and consist of many lines of ancestry. Mr. Woodbury listed the uses for autosomal DNA tests. They include general interest, ethnicity (within 6 generations), adoption, unknown paternity, illegitimacy, and difficult to trace ancestors. I have done two autosomal DNA tests, one through AncestryDNA and the other through Family Tree DNA. I've shared the results of those tests in previous blog posts. If you'd like to read them, click on the following links. I also had a mtDNA test done through Family Tree DNA, but I haven't shared those results on my blog yet. I'm glad I had my DNA tested. I'm hoping to have my husband get his DNA tested as well. In the late afternoon, I attended Valerie Elkins' excellent class titled "Getting a Great Genealogical Education Online." She's a wonderful person and a great teacher! There are so many amazing online resources to further our genealogy education. Valerie listed many of these in her class including FamilySearch, Cyndi's List, the credentialing organizations Board for Certification of Genealogists (BCG) and The International Commission for the Accreditation of Professional Genealogists (ICAPGen), webinars, online schools, genealogy blogs and websites, social media, and many more. 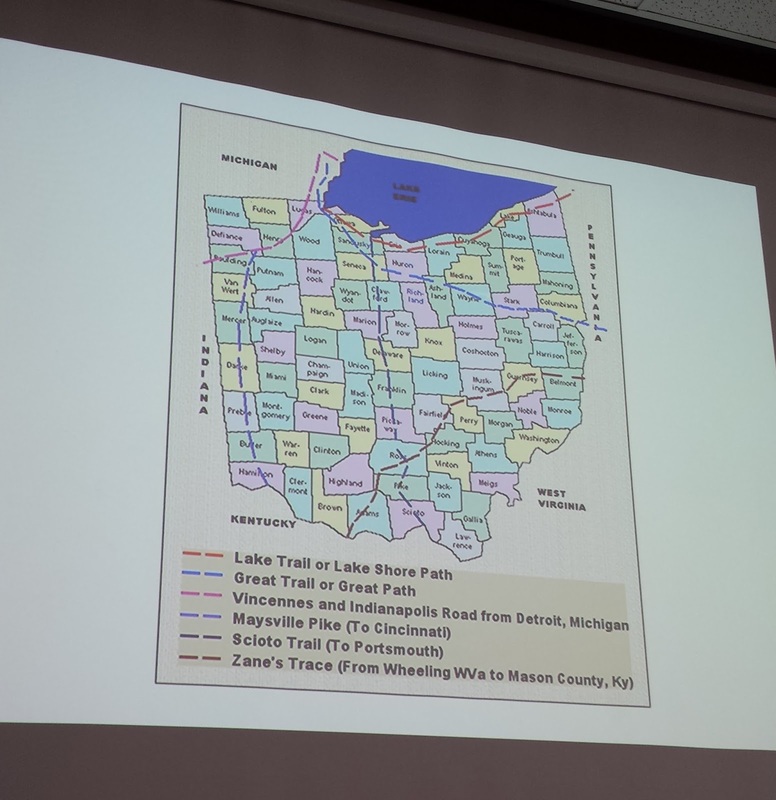 During her class, Valerie showed the following slide which listed several genealogy blogs. I was so honored to find my genealogy blog listed in Valerie's slide. Included in her syllabus are additional genealogy blogs not listed in her slide. Unfortunately, her syllabus was not included in the syllabus for the conference. She said we could access it by going to her website at www.valerieelkins.com and then click on the Resources tab. I want to thank her again for listing my blog in her slide and syllabus! If I counted correctly, there were 151 classes and 23 tracks offered at the BYU Conference on Family History & Genealogy. One of the tracks offered was the ICAPGen Track. ICAPGen stands for "The International Commission for the Accreditation of Professional Genealogists." The first class I took on Tuesday, July 28, 2015 was titled "Why Become Accredited?" by Jill N. Crandell. I am not a credentialed genealogist at this time. Perhaps someday I will pursue certification or accreditation. Certification and Accreditation are two different pathways to becoming credentialed. 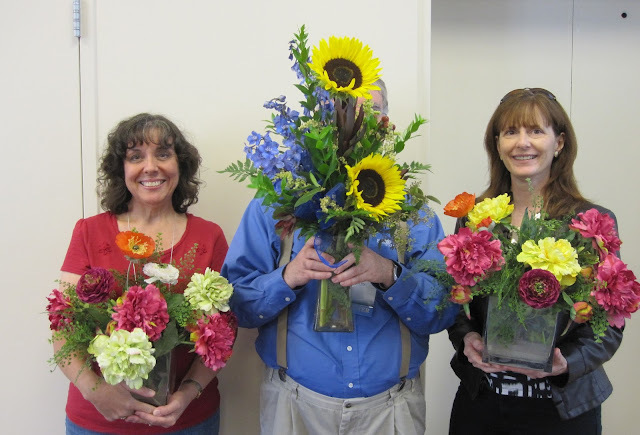 Certification is through the Board of Certified Genealogists. Accreditation is through ICAPGen. One of the things I learned during this class was that The Church of Jesus Christ of Latter-day Saints had been involved in the accreditation process. In 2000 the Church transferred ownership of accreditation to ICAPGen. Peggy Clemens Lauritzen, who is an Accredited Genealogist, wrote a blog post titled "Why I Will Not Seek Certification." Regarding the accreditation process in her post she wrote that, "the testing was done by the LDS Church at the Family History Library." To read her post, click HERE. 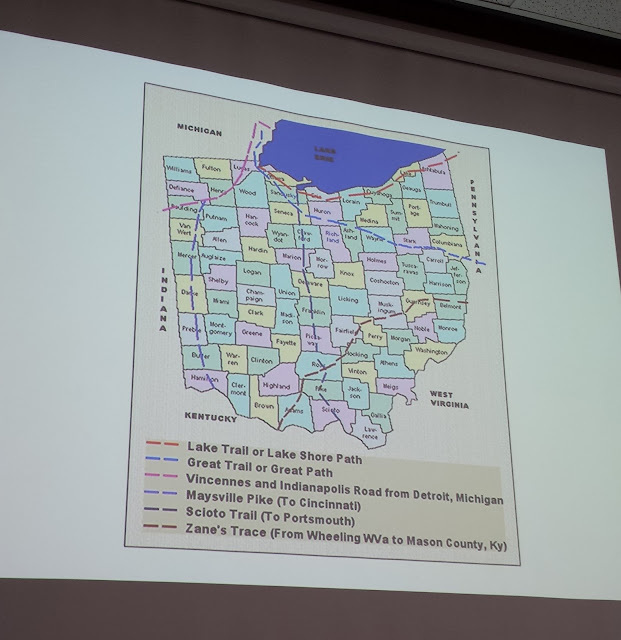 Speaking of Peggy Clemens Lauritzen, I attended her class titled "The Firelands, the Connecticut Western Reserve, and the Ohio Territory. Peggy is an amazing teacher! She's fun and engaging and very informative. If you ever have a chance to take a class from her I highly recommend you take the opportunity to do so. Peggy LOVES maps! She showed several to the class during her presentation. 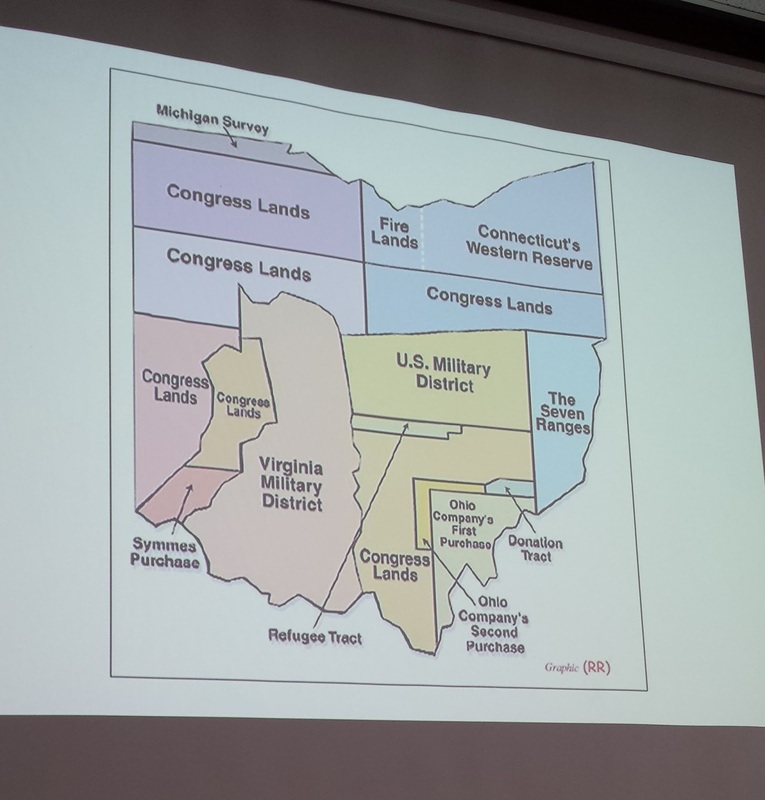 One of the things I learned from Peggy's class is that the area in Ohio referred to as the Firelands was given this name because this area was given to people in Connecticut whose homes were burned down by the British during the Revolutionary War. After lunch on Tuesday I attended "Fun With Citing Sources!" by Jean Wilcox Hibben. Citing our sources is so very important. Source documentation is extremely important not only for yourself, but for those who access your genealogy research in the future. Jean listed several different styles for writing citations including Turabian, (MLA) Modern Language Association, APA, and Chicago Manual of Style. I only attended three classes on Tuesday. In the afternoon I headed over to the myFamily History Youth Camp. I wrote about my visit in an earlier blog post. If you'd like to read that post, click HERE. I recently watched Legacy Family Tree's QuickTip video called "Creating a Migration Chart." I was intrigued. I hadn't made this kind of chart before. I have used Legacy Family Tree for a number of years and still have a lot to learn about the many features it offers. I decided to make a migration chart for my maternal 2nd great-grandfather, Ebenezer Perry Carlisle Webster. As you can see, this is quite an interesting chart. Not only are U.S. states listed, but the countries of Brazil and Mexico are listed as well. 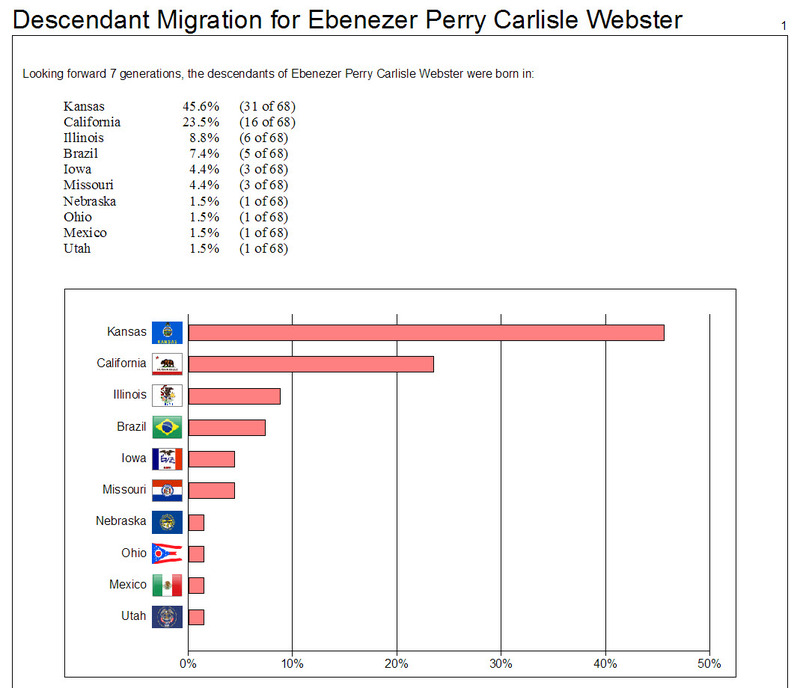 That's because Ebenezer's son, Watson (Frederick) Emory Webster, is my great-grandfather. You may know him as "The Traveling Dentist" here on my blog. He was born in Ohio, but traveled to Mexico where he married my great-grandmother, Esther Matus Villatoro. They then traveled to and settled in Brazil. Of course, settling in Brazil didn't mean he stopped traveling. But, that's another story. 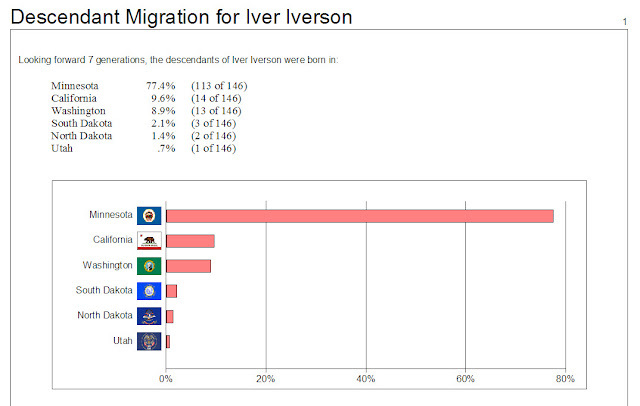 Here's the migration chart for my paternal 2nd great-grandfather, Iver Iverson. Iver was born in Norway on 2 August 1827 in Marteplads, Nes, Buskerud, Norway. He immigrated to the United States in April of 1858 and settled in Minnesota. He served in the United States Civil War in the 34th and 21st Iowa Infantries. 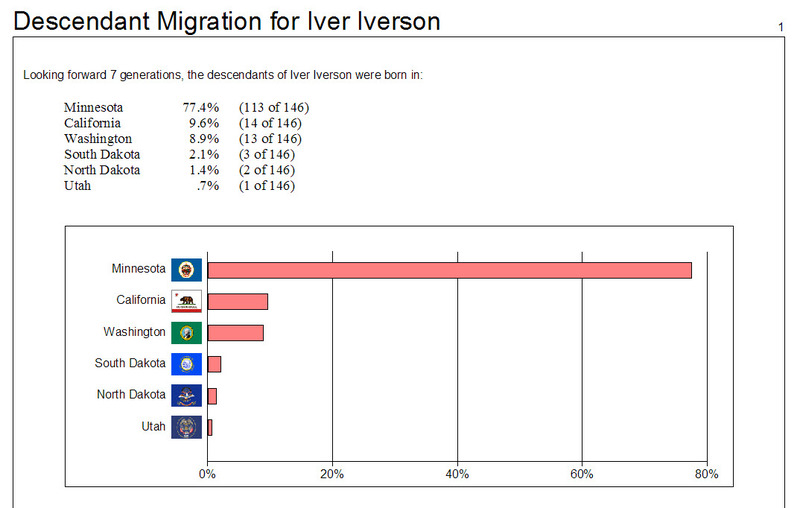 From this chart I can see that the majority of Iver's 146 descendants were born in Minnesota. If you are use Legacy Family Tree and would like to learn how to create a migration chart, please click on the QuickTip video link below. Hello wonderful readers! Fab Finds is back from it's one-week hiatus. The photo above may give you a clue as to where my family and I were last week. Yep! Utah! One of the places we went while we were there was Bryce Canyon National Park. What a stunningly beautiful place! Thanks for your patience while Fab Finds was on hiatus. Tuesday’s Tip: Maybe those online trees aren’t ALL bad … by Jenny Lanctot, author of Are My Roots Showing? Sepia Saturday: Before e-Harmony by Wendy Mathias, author of Jollett Etc. GTFT ~ GROWING THE FAMILY TREE! Attendees at the BYU Conference on Family History & Genealogy were given a generous hour and a half lunch break each day from noon until 1:30. Lunch was available for purchase at the Morris Center Cafeteria, which is close to the BYU Conference Center. 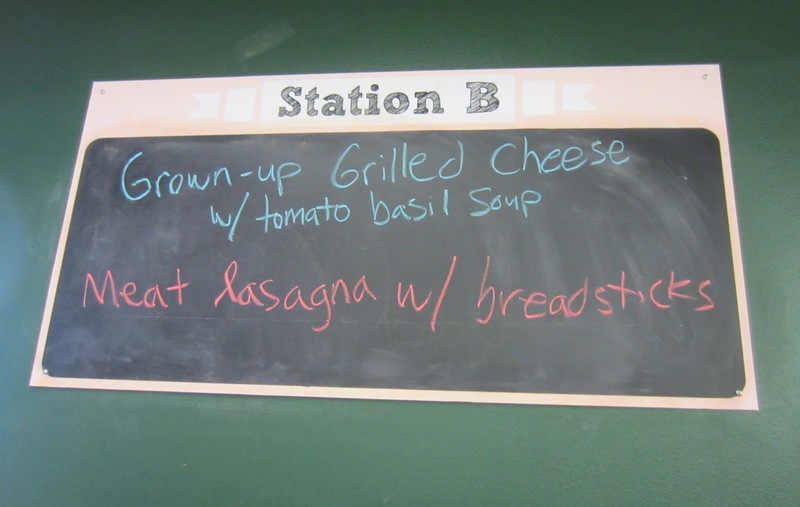 The food was served cafeteria style, but was not your typical average cafeteria fare. The food was very good. There was a salad bar and two hot entrees offered each day. On Friday I had the Grown-up Grilled Cheese Sandwich with Tomato Basil Soup. It was delicious! 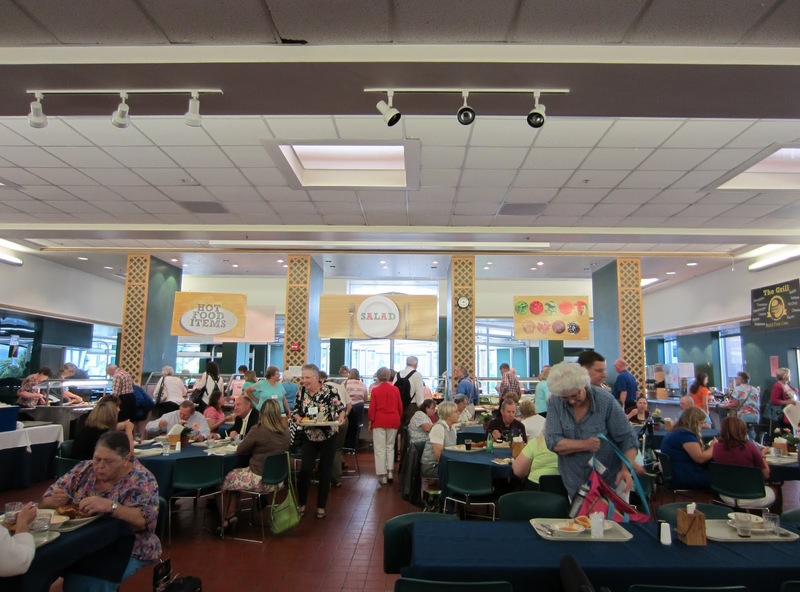 Here are some photos of the Morris Center Cafeteria during lunch at the conference. A variety of delectable desserts were offered each day including BYU's famous Creamery Ice Cream. I've had BYU's Creamery Ice Cream during past visits with family in Utah, so I already knew how amazing it is. Of course, I couldn't resist having some during the conference, so on one day I had their Chocolate ice cream, and on another day I tried their Mint Brownie ice cream. Yummy! On Thursday I had one of BYU's amazing Mint Brownies with Chocolate Frosting. I wish I had taken a picture of these delicious treats. I was able to find recipes for the Mint Brownies on the BYU Alumni page. To see them, click HERE and HERE. The second link not only gives a recipe for the Mint Brownies, but also provides recipes for three other desserts. In addition to enjoying delicious food, it was fun spending time chatting with fellow genealogy blogging friends during lunch at the conference. In addition to attending classes and keynote addresses, attendees at the BYU Conference on Family History & Genealogy had the opportunity to stop by the booths of twenty-eight vendors to learn about their products. Vendors lined the main hallway at the BYU Conference Center throughout the conference. And Room 2260 was filled with vendors on Wednesday and Thursday. Here are photos of the main hallway. The vendors are next to the windows. The BYU Bookstore had a window at the conference too so that attendees could purchase various items. Unfortunately, the Bookstore was closed when I took this photo. This is Janet Hovorka, Development Director at Family ChartMasters and author of The Chart Chick blog. Janet and her employees create beautiful family history charts. Janet is also the author of the Zap The Grandma Gap books and workbooks. Here's Renee Zamora at the RootsMagic booth. These are photos of the Vendor Hall in Room 2260. Sue Maxwell, Bob Taylor, and Bob Ives at The Family History Guide booth. Please check out this helpful website. It's free. The Family History guide has a Facebook page, which you can access by clicking HERE. They also have a blog. You can check out their blog by clicking HERE. Sue Maxwell demonstrated The Family History Guide website for me. Here's the My Mission booth. I was able to speak to the developer of the My Mission app and was quite impressed by what I heard. It's free too, which is awesome. Families of LDS missionaries past and present ought to check it out. 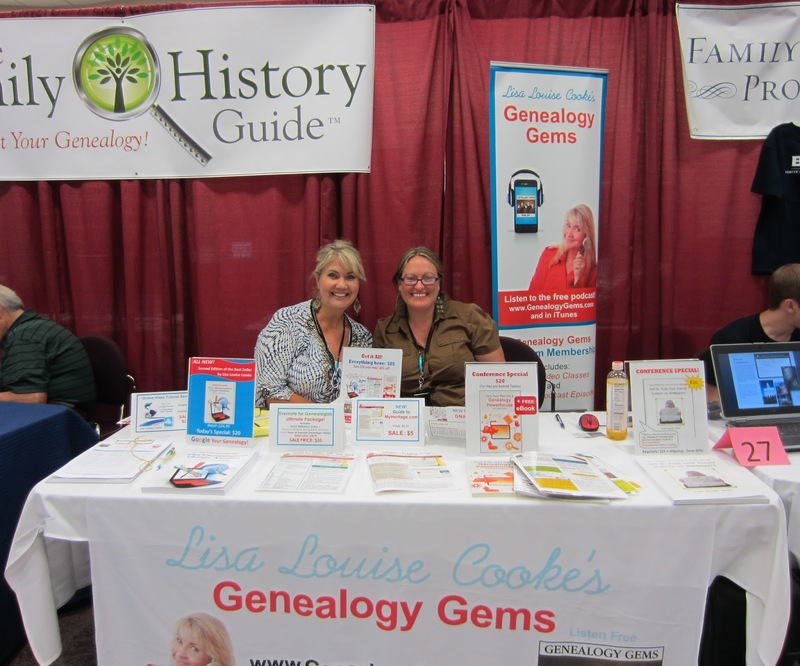 Here's Lisa Louise Cooke and Sunny Morton at the Lisa Louise Cooke's Genealogy Gems booth. Unfortunately, I didn't take pictures of each vendor booth. But here's a list of the vendors at the conference. 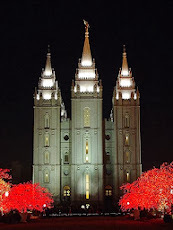 One of the really fun aspects of attending the BYU Conference on Family History & Genealogy was the opportunity to meet fellow genealogy bloggers. I've been friends with them online for quite a while and it was fabulous to finally meet them in person. I made sure to take pictures with all of my wonderful blogger friends. Peggy Lauritzen, author of Always Anxiously Engaged, was so welcoming to me. She really helped me feel at ease at my first national genealogy conference. She's a dear sweet lady. We had lunch together at the Morris Center on Tuesday, which was the first day of the conference. She was also a presenter at the conference. Another sweet and kind fellow blogger that I was able to meet in person was Janet Hovorka, Development Director at Family ChartMasters and author of the blog The Chart Chick. She is also the author of the Zap the Grandma Gap books and workbooks. Janet truly is a delightful person. I so enjoyed getting to know her better. In addition to manning the Family ChartMasters vendor booth in the main hallway, Janet was a presenter at the conference. It was also my pleasure to meet Valerie Elkins, another sweet and wonderful blogger friend. 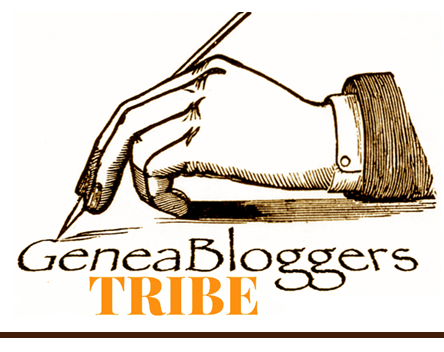 Valerie is the author of the blog Family Cherished. She also was a presenter at the conference. Valerie is an amazing and lovely person and it was wonderful to get to know her better. Janet, Valerie and I went out to lunch together on Wednesday. It was so fun! One of the other official conference bloggers was Lynn Broderick, author of The Single Leaf. She was very helpful and kind and it was great to meet her. This is Sue Maxwell, author of the Granite Genealogy blog. What a wonderful person she is! 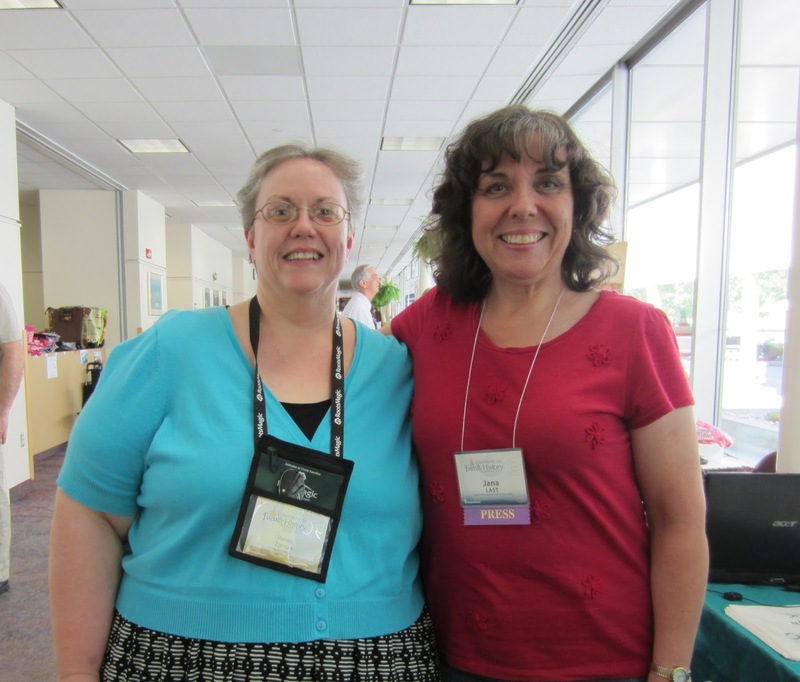 I met Sue in the vendor hall while she was helping at the The Family History Guide booth. It was so fun talking with her. 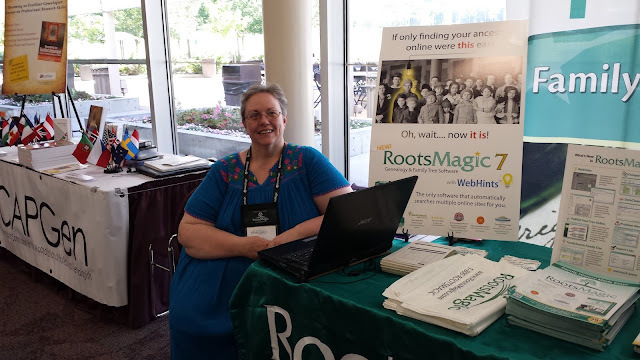 Renee Zamora, author of Renee's Genealogy Blog, was in the main hallway manning the RootsMagic booth the entire conference. It was great to finally meet Renee. I also finally got to meet The Ancestry Insider in person. 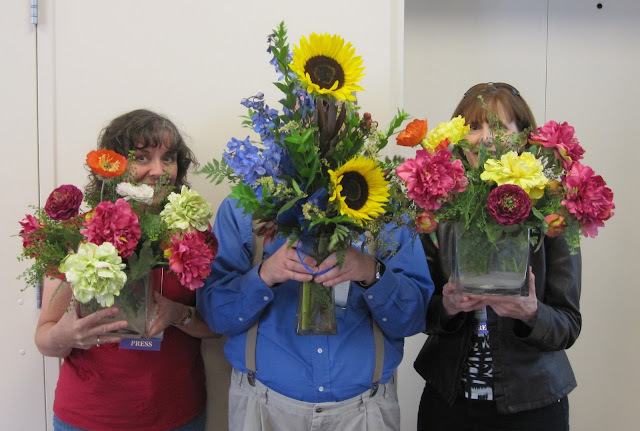 Lynn Broderick had the fun idea to take photos of us together with him. Official Conference Bloggers - Myself, The Ancestry Insider and Lynn Broderick. Thank you Lynn for allowing me to use your photos in my blog post. They turned out better than mine did. And thank you for the idea of getting us together to take these fun photos with The Ancestry Insider. 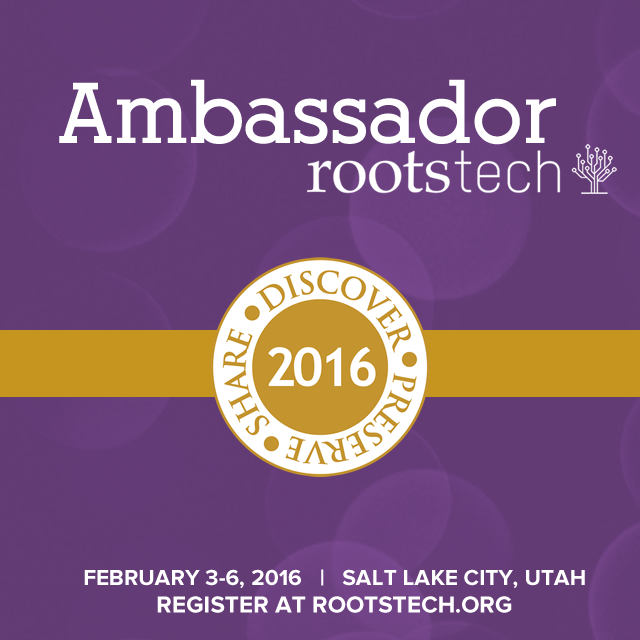 I'll be sharing more about the BYU Conference on Family History & Genealogy in future posts.